Bearing in mind how difficult it was for Donald Trump to find anyone prepared to sing at his inauguration (he was turned down even by Andrea Bocelli), it’s inconceivable that his advisers weren’t out chasing the standard, all- American operatic A-List. Somewhere at the top of that list, and no stranger to performing at the White House, would have been Thomas Hampson. 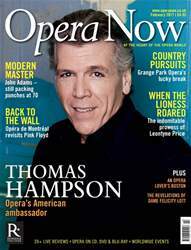 For the past 30 years, Hampson has been the emblematic, go-to lyric baritone of North America and something of a poster-boy (though at the age of 61 he qualifies as ‘man’) for serious singing in the New World. Handsome, smooth, sophisticated, intellectually sharp and politically astute, he’s what anyone would want to lend their presidential gig the necessary style and gravitas. So when we met to talk (and Hampson certainly can talk) at Covent Garden during his pre-Christmas run of all the villains in Offenbach’s Les contes d’Hoffmann, there were two questions I couldn’t resist. Had he been approached? And what would his response be? Needless to say, I didn’t get a straightforward response: Hampson doesn’t do straight answers. He delivers discourse – with conviction, forethought, and a complicated if assertive eloquence that keeps you on your toes. It felt as if I were being viva’d for a First at Oxford.